In an interview with Medical News India (MNI), Dr. K K Aggarwal, President, Health Care Foundation of India shares his views on the cardiac cases in India and why our country needs a National Cardiovascular Control Programme — on the lines of Mental Health Programme and Cancer Programme. A Padma Shri recipient, Mr. Aggarwal comes with an immense experience in the field of cardiology. Please tell us about your motivation that led to the establishment of Heart Care Foundation of India? Dr. K K Aggarwal: We established Heart Care Foundation of India in 1986 as a National NGO to create awareness about all aspects of health in general and heart care in particular for people from all segments of the society incorporating all systems of medicine under one roof. At that time there was no concept of health reporters or health pages but today every newspaper and channel have both. In the last 33 years journeys, the government of India has released two National Postal Commemorative stamps, one state commemorative postal cancellation stamp in HCFI initiated campaigns. The foundation also has the distinction of three Limca book of records and record 25 Perfect Health Melas. An approximately 31 per cent of the global population die due to cardiovascular disease, and India witnessed a steep rise of 34 per cent. How can one prevent this? Dr. K K Aggarwal: India has the largest number of heart patients in the world both in terms of absolute numbers and prevalence. Being an Indian is a risk factor. An Indian doctor settled in the USA is 17 times more prone to get a heart attack than a US doctor settled there. An Indians on an average gets heart attacks 10 years earlier. Indian coronary arteries are smaller, diffusely diseased and the mortality is high and early. Indian risk factors are also slightly different as we have more metabolic syndrome, potbelly obesity, diabetes, high triglyceride level and low HDL cholesterol levels. What steps are the government taking to control the spike in heart attack cases? Dr. K K Aggarwal: Unfortunately, the government does not have a National Cardiovascular Control Programme even today. They are still running a pilot project. They do have a full-fledged Mental Health Programme and Cancer Programme. The government is neither working on harm elimination nor harm reduction. On one side, they are not banning tobacco products and on the other hand, they are not allowing less harmful non- tobacco nicotine-based products. There are also cases of sudden cardiac arrest. It is said that our body gives a signal before anything happens to us. What are the warnings that a body observes before a sudden cardiac arrest? Dr. K K Aggarwal: Over 20 lakh people die of a heart attack every year in India with most dying before reaching the hospital. Most of them do face signals of heart ailment hours of the day before the cardiac arrest or attack but are often ignored. Any acidity after the age of 30 appearing for the first time is Heart Attack unless proved otherwise and also any breathlessness appearing for the first time in life after the age 30 is cardiac in origin. Any symptom which is unusual, unexplained or appearing for the first time in life after age 30 should not be ignored. Remember ECG can be normal in the first few hours of a heart attack. How do you see IT providing benefits to patients as also medical practitioners in the taming this disease? Dr. K K Aggarwal: The future will be online emergency cardiac consultations, online transfer of ECGs, robotic online echocardiography, online prescriptions, online pharmacies, online risk factor analysis and online risk reduction tools. How IT tools like artificial intelligence (AI), machine learning (ML) could help doctors tackle heart attacks before they happen? As per a recent study, a drug commonly used to treat high blood pressure and chest pain could be associated with an increased risk of sudden cardiac arrest. What is the way out? Dr. K K Aggarwal: Sudden cardiac death is due to a heart arrhythmia that is an abnormal and fast heartbeat, which can happen if your pumping action of the heart is low or you have electrical instability of the heart. Drugs which can precipitate abnormal heart rhythm are usually not prescribed or are given under medical supervision. Heart patients on Viagra-like drugs if they take nitrates can develop dangerously low blood pressure and even die. A BP drug Nifedipine also is linked to cardiac arrest due to arrhythmia but is no more used now in India. How do you see Ayushman Bharat healing heart cases in India? Dr. K K Aggarwal: Ayushman Bharat will help once the Wellness Centres start in India and they start talking about heart screening and prevention advice. One good thing is the treatment now will be affordable by all as up to Rs 5 lakh Rs will get covered under the scheme. Except for heart transplant, all treatment should be available within Ayushman Bharat. What is your formula of 80 to live up to 80 without a heart attack? 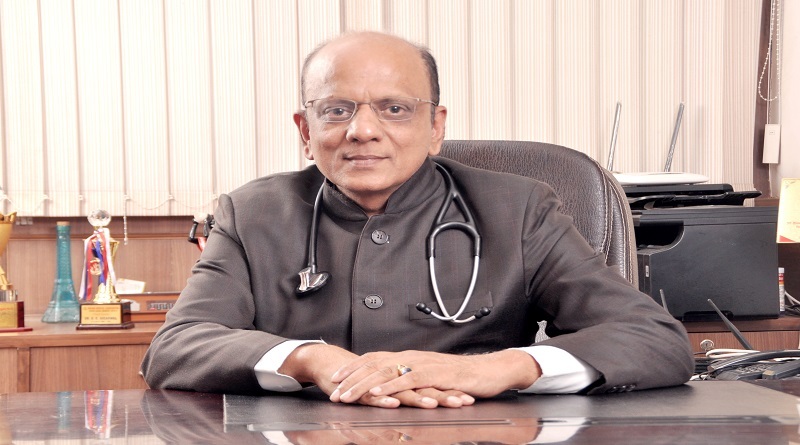 Dr. K K Aggarwal: One needs to have ideal health parameters and lifestyle. In order to achieve this, it is favourable to maintain fasting blood sugar (FBS) (mg%), fasting low-density lipoprotein (LDL) cholesterol (mg/dL), diastolic lower blood pressure (mm Hg), resting heart rate, and abdominal circumference (cm) all below 80. Simultaneously keep your lung and kidney functions above 80 per cent. For this walk 80 minutes a day; brisk walk 80 minutes a week; walk at least 80 steps in a minute; do not eat carbohydrates or wheat 80 days in a year; do 80 cycles of pranayama or parasympathetic breathing a day; sit for sunlight 80 days in a year; do not take alcohol or take it less than 80 ml in a day and less than 80 grams in week. With this, you will not get a heart attack and even if you get ask your doctor for 80 mg aspirin and 80 mg statin. You will not die and even if you die there are 80% chances some bystander will cone and give you CPR 10 and save you.